Land your dream clients with issue 291. Whether you're looking to go freelance or land full time work with your dream client, you're going to need a good portfolio. But what are the top studios looking for? Find out in Computer Arts issue 291, which goes on sale today. 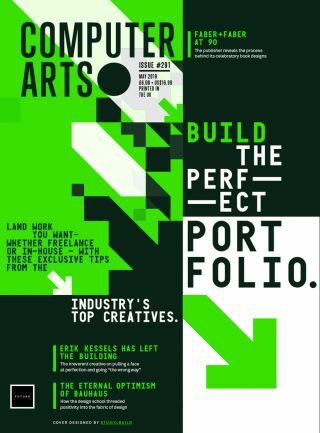 In this issue we talk to top creative directors and hear what it takes to craft a killer portfolio, as well as learning best practices to help you really show off your work. We also cover interview techniques that will win over clients, as well as discovering what designers need to do to make their work visible in a more connected, digital age. So if you're looking to take your career in a new direction, or give it a kickstart straight out of design school, this is the issue for you. Elsewhere in issue 291, we mark a landmark birthday in the design calendar as legendary German movement Bauhaus celebrates its 100th anniversary. We also catch up with the maverick KesselsKramer creative director, Erik Kessels, ahead of his talk at Us By Night. Meanwhile, Jack Renwick Studio shares how it combines strategic thinking and a grounded approach to create brands that make a difference. On top of this, there's our showcase of all the hottest new design projects. You won't want to miss it. Take a closer look at what's inside Computer Arts issue 291 by scrolling left to right through the gallery below. Computer Arts is the world's best-selling design magazine, bursting at the seams with insight, inspiration, interviews and all the best new design projects. For all this delivered direct to your door each month, subscribe to Computer Arts. Right now you can save up to 59 per cent.